Even though they live across the pond, Americans have been obsessed with royal life for years. This still holds true and with all of the recent royal weddings, many brides are looking to the newest duchesses for wedding inspiration. The most recent jewelry trends are coming straight from these fairy tale events. A rising jewelry trend includes rings like the three-stone engagement ring Prince Harry gave to Meghan Markle, now the Duke and Duchess of Sussex. This style was already becoming more popular on its own, but now has gained huge appeal. Since their engagement, three-stone rings have taken center stage as they symbolize the past, present and future. The middle stone can be the same size as the two outer stones, or it can be larger like Meghan’s cushion cut sparkler. The royal pair had the ring custom made to hold special meaning to them as a couple. This is another up and coming trend, and many jewelers are seeing more requests for custom-made pieces following the royal engagement and wedding. Many brides-to-be want to combine strong elements of personalization and follow Meghan’s lead. Her outer two diamonds were from Princess Diana’s personal collection and the center stone is from Botswana, a place that holds special meaning to them both. If you have an engagement ring and a wedding band ask your jeweler to solder them together. Why? 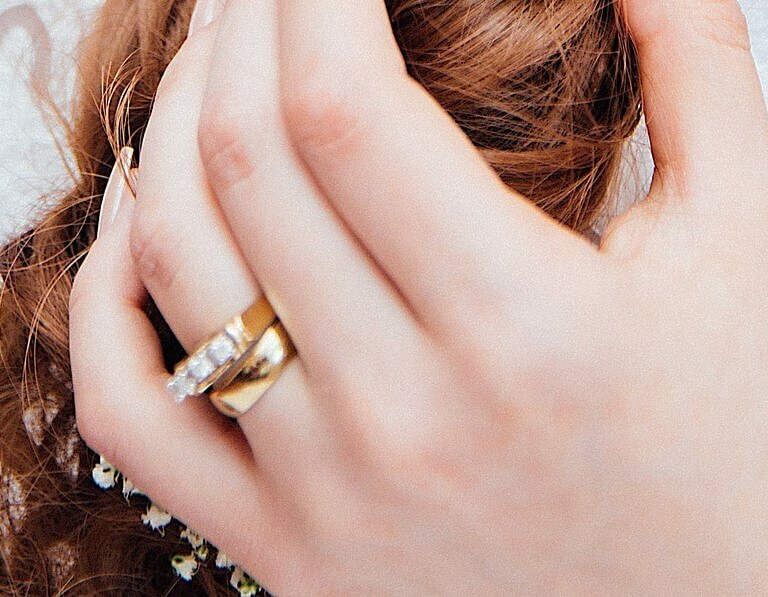 If not soldered, the rings constantly rub against each other, wearing down the metal, explains Amy Helein, Lavalier jewelry insurance expert and GIA Graduate Gemologist. But that’s not all. Amy says the rubbing can loosen and even chip stones, especially pave-set diamonds. Getting your rings soldered together is inexpensive, yet pays big dividends in preserving them as a lasting treasure. Proposing this holiday? Make it memorable! Proposing marriage is a milestone in your life. You’ll be telling this story to friends and family for years, decades. So, make the proposal memorable. Here are a few decisions you’ll need to make. Decision 1: Buy the ring in advance or pick it out together? A winter chill is in the air, Main Street is decorated with lights on the lampposts, and there’s fresh greenery on your mantel. It’s a magical time of year, and some of you might have decided to make your holiday season even more joyous — with an engagement. If that’s you, wonderful! We hope the eggnog tastes just a little sweeter and the tree lights shine just a little brighter for you this year. But while you’re enjoying them, take some time to begin the wedding planning. Santa can bring you many treasures, but time isn’t one of them. Get started early and you’ll thank yourself once the big day is just around the corner. Even ditzy Phoebe from Friends can run down the checklist of what makes a typical marriage proposal (Season 10, Episode 5 for those of you with Netflix – they added the full series on January 1st!). But proposing on the Jumbotron, at a candlelit restaurant, or with a box of chocolates and bouquet of roses is so 2014. Lavalier revamps three proposal clichés so you can get it right. The New Year is a time for new beginnings, and what better way to start it off than by taking your relationship to the next level? New Year’s Eve is a popular day for proposals, but this festive holiday presents some unique proposal challenges. Follow Lavalier’s guide to the who, what, where, when, why, and how of a perfect New Year’s Eve proposal! Last night you proposed to your girlfriend with the engagement ring of her dreams, and she said yes. You popped a bottle of champagne, hugged, kissed, talked about wedding plans, popped another bottle, and went to bed dreaming of the big day. The morning after, what’s the first thing you want to do (after taking a few aspirin for that hangover)? If you’re like most people, you can’t wait to share the good news with your friends, family, strangers, the mailman, the customer service rep at your cable company, and pretty much everyone else. However, there are some general dos and don’ts you should keep in mind after you propose, including who you tell about the engagement (and how you tell them!). Follow Lavalier’s list of post-proposal dos and don’ts to make sure you’ve taken care of everything and haven’t left anyone out in the cold. Well, it’s official (sort of). Studies suggest that Millennials (born in the 80s and 90s) are more likely than their parents to go #YOLO on their wedding day and opt for a destination wedding. Locations like the Caribbean, Europe, or Hawaii are popular choices, but many couples keep it continental as well. Either way, what do all destination weddings have in common? Beautiful scenery and a once-in-a-lifetime experience. But there’s a catch. While travelling is great, it can also be expensive. And this can be a problem for your friends in their 20s or 30s. Many young professionals will find it difficult to fly across the globe at a moment’s notice. While there are plenty of lists out there for proper etiquette for destination weddings, let’s take a look at a few Dos and Don’ts tailored specifically to 20- and 30-somethings.